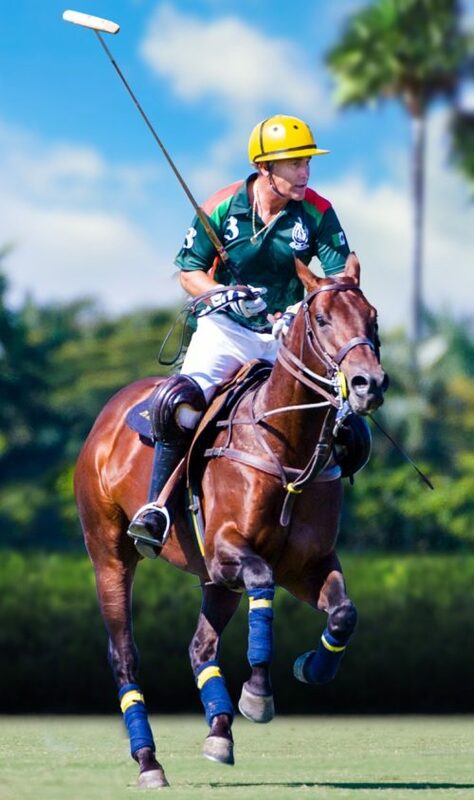 Empire Polo Club is excited to announce that legendary polo player Memo Gracida will join the staff as Polo Director. 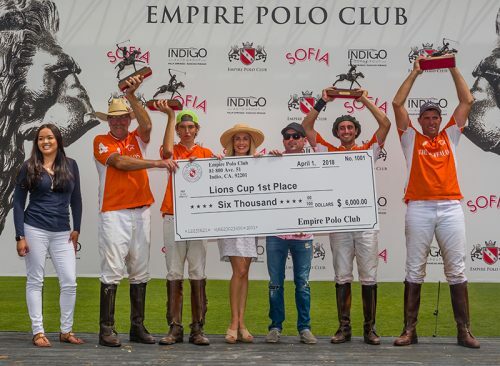 Memo will work with Vicky Owens, Empire’s Polo Manager, to help recruit teams and players. He will also be working closely with Kevin Ittig, who oversees Empire’s Grounds Crew, to ensure that the fields are in prime condition for the winter season. 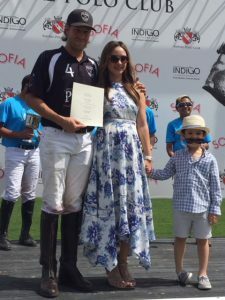 While Gracida’s career as a professional player has set an exemplary standard for those who now follow in his footsteps, it is his exceptional ability to coach, educate, and organize polo players, teams and programs that drew Empire’s interest. 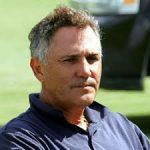 “After spending the summer in Santa Ynez working with Memo, I see that he has a wealth of experience and exciting ideas about how to grow polo. I’m excited to have his help with Empire’s continued growth,” said Vicky Owens. The addition of Gracida to Empire’s management team is only the beginning of Empire’s strategy for this new season. Two new venues will open this coming winter: Calhoun Ranch and Empire Grand Oasis. Calhoun Ranch will feature a grass polo field, an indoor polo arena, with plans for a second arena in the works, stabling and 80 acres of large grass pastures. Empire Grand Oasis will be the most precious gem in Empire’s crown. Members will have the opportunity to enjoy a 5,000 square foot clubhouse, a tropical swimming lagoon flanked by palm trees, lush landscaping with waterfalls, and an authentic Tiki bar. Adjacent to the lagoon is a newly installed grass polo field, a natural amphitheater and an indoor polo arena; there are plans for three additional grass polo fields. Empire Polo Club hosts fun parties, offers affordable polo, maintains immaculate grass fields and is a world-class equestrian facility. It is the perfect polo destination for polo players and their families. 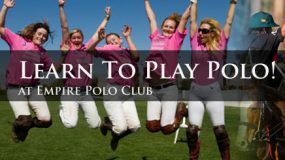 At Empire Polo Club there are opportunities for all levels of players. The 8-Goal League is played February – March. The 4-Goal League begins in January and continues through the end of March. There are 1-Goal polo tournaments almost every weekend. 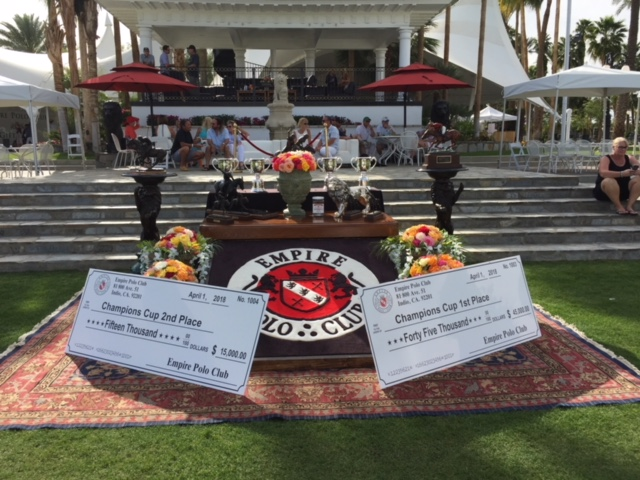 If you are interested in more details about Empire’s polo leagues and playing memberships, please contact Vicky Owens at 760-963-9930 or email vickyowens@empirepolo.com. EmpirePolo.com is also a great source of information. Memo Gracida. Photo by D. Lominska. Memo Gracida’s international career includes several record-setting achievements. 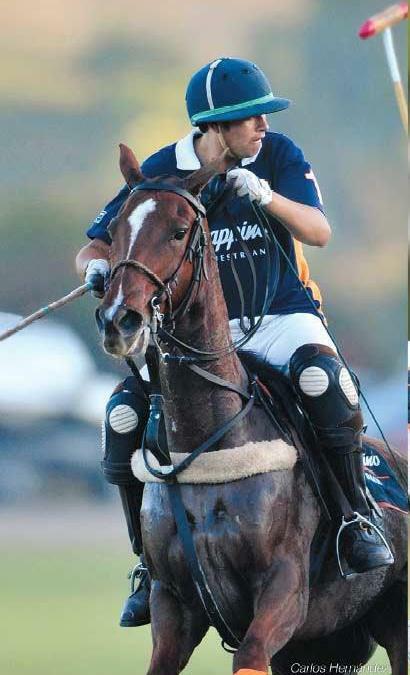 Most notably, Gracida holds the highest record of 16 U.S. Open Championship victories and the most consecutive years as a 10-goal professional polo player: 21 years. These many global major tournament wins led to Memo’s selection as Player of the Centennial Era in 1990 and his induction into the National Polo Hall of Fame in 1997, the first time an active player had ever been inducted. 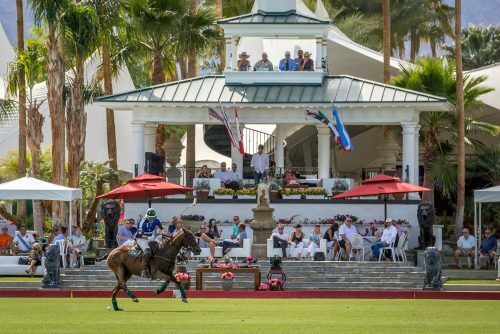 The Empire Polo Club cashes out the season with a $60,000 money game for the Champions Cup. Former 10-goaler Memo Gracida had guided his La Herradura (Meghan Gracida, Carlos Hernandez, Memo Gracida and Catlin Dix) through their first three Championship Cup wins but was forced into a coaching position in the tournament final against the imposing Evergreen lineup (Tom Sprung, Carlitos Galindo, Juan Jo Gonzalez and Shane Rice). 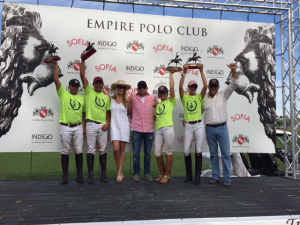 La Herradura (L to R) Santi Torres, Carlos Hernandez, Catlin Dix, Meghan Gracida and Memo Gracida celebrate a $45,000 win in teh final of the Champions Cup. 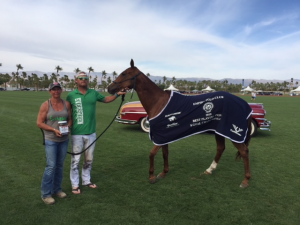 Evergreen had ruled the fields at the Empire Polo Club since the beginning of the year, taking top honors in 4-goal competition in the Stagecoach Challenge, the USPA Circuit Players Cup and the USPA General Patton Cup. 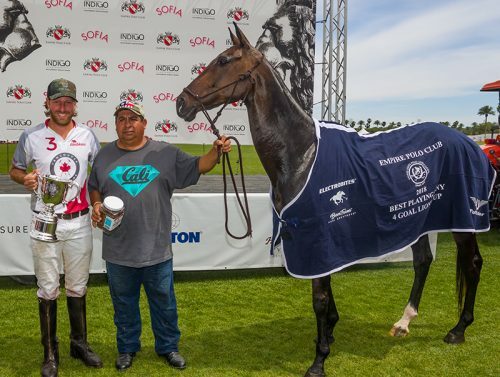 The Evergreen lineup changed for the 8-goal USPA Constitution Cup in March as they went undefeated once again, but for the season-ending $60,000 Champions Cup they ran into Memo Gracida’s La Herradura entry. Both La Herradura and Evergreen bowled over their first three opponents before facing one another in the tournament final. A fall suffered by Memo Gracida on Friday, March 30th, however, sidelined the Hall of Fame legend, forcing La Herradura to bring in 6-goaler Santi Torres in an effort to fill out the lineup. A tenuous start saw Evergreen take advantage of a foul by La Herradura, with Shane Rice converting a 30-yard penalty shot for the early lead. Carlos Hernandez, who had been a scoring powerhouse for La Herradura, tied the game with his first goal of the day. Back-to-back goals from Santi Torres ended the first period with La Herradura on top of a 3-1 lead. Fouls continued to plague the La Herradura lineup with, Rice converting two 40-yard penalty shots. Hernandez scored his second goal of the game, keeping La Herradura in the lead,4-3 as the second chukker ended. Shane Baum of Leisure Society presents the MVP trophy to La Herradura’s Carlos Hernandez. Gonzalez scored the go-ahead goal for Evergreen to end the first half with a 6-5 advantage. Memo Gracida might not have been on the field but he was in the team tent at the end of the field. The direction appeared to take hold. Hernandez tied the game with a goal from the field followed by a penalty goal for a 7-6 lead. Torres scored the final goal of the chukker as a solid defensive effort shut down the talented Evergreen attack and edged La Herradura ahead, 8-6. Hernandez and Torres traded goals with Galindo and Rice in the fifth, with La Herradura maintaining their two goals lead, 10-8, with one chukker left in regulation play. Playing as if the score was tied, La Herradura exploded in the sixth. Meghan Gracida took the opening throw-in and raced 150-yards down the field for her first goal of the game and a three-goal, 11-8 lead. Rice responded with a goal for Evergreen that cut the lead back to a manageable two goals, 11-9. The teamwork between Torres and Hernandez continued to pay off. Torres scored twice from the field with the two La Herradura players taking turns passing the ball to one another and blocking out opponents for a 13-9 edge. With time running out, Rice scored on a 60-yard penalty shot but it was too little, too late. Torres scored the last goal of the game on a 40-yard penalty conversion as La Herradura celebrated the 14-10 win and a check for $45,000, the winner’s share of the purse. Evergreen suffered their first loss of the winter season but were comforted with a check for $15,000 for their second-place finish. Shane Rice with Midget, winner of the Best Playing Pony award. “It was a tough match“, said Meghan Gracida after the game, “but our team played as a team and pushed hard. Our horses were amazing and so was our coach (Memo Gracida)“, she added, “So happy”. Torres led all soring with eight goals. Hernandez scored five times and earned MVP honors while Meghan Gracida added a goal for the win. Rice’s six goals (three on penalty conversions) led the Evergreen attack. Galindo added three goals and Gonzalez scored once in the loss. Rice’s horse, Midget, was named Best Playing Pony. La Herradura and Evergreen weren’t the only teams going home with money in their pockets as the Buffalos (Ross Adam, Tim Rudy, Felipe Sordelli and Riley Jordan) took the winners share of an $8,000 purse while the Vancouver/Mother Chukkers (Jay Garnett, Nicolas Maciel, Robert Payne III and Sukey Forbes) settled for $2,000 for a second-place finish in the 4-goal Lions Cup. The Buffalos won the Lions Cup Final and $6,000. Ross Adam, Riley Jordan, Felipe Sordelli and Tim Rudy. 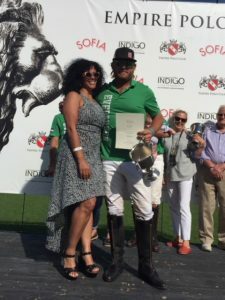 Robert Payne opened the scoring in the 4-goal Lions Cup final with a goal from the field for the Vancouver/Mother Chukkers. Tim Rudy converted a penalty shot to tie it at 1-1 and teammate Felipe Sordelli added a goal from the field for a 2-1 Buffalo lead. Shutout defense by the Buffalos in the second period of the four chukker final was nearly all defensive in nature. Riley Jordon scored the only goal of the period, giving the Buffalos a 3-1 halftime lead. The two teams exchanged goals in the third, matching one another goal-for-goal. A pair of goals from Payne were countered by single goals from Sordelli and Rudy (penalty goal). The lead remained with the Buffalos, 5-3. For the second time in the match, Vancouver/Mother Chukkers were unable to mount a successful attack. Rudy’s third goal on the day accounted for all of the fourth chukker scoring as the Buffalos left the field celebrating the 6-3 win. Rudy scored a team high three goals for Buffalo. Sordelli added two goals and Jordan accounted for a single goal in the win. All three Vancouver/Mother Chukkers goals came from Payne (two on penalty shots). The Lions Cup and the Champions Cup were the final polo tournaments of the season at the Empire Polo Club and signaled the end of a 14-week season that included women’s competitions and Friday night polo under the lights as well as regular Sunday afternoon tournament action. BPP was Renatta, owned and played by Robert Payne III. The Empire Polo Club is located at 81-800 Avenue 51 in Indio, CA. For further information go to the club website at http://empirepolo.com or call 760-342-7755. Entrance for Friday night games is on Ave. 50 between Madison Street and Monroe Street. 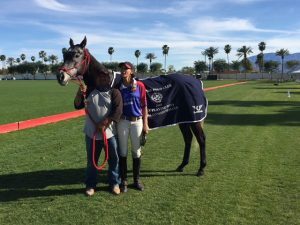 Carlos Hernandez scored eight goals in lifting La Herradura to a 13-11 win in Champions Cup play Sunday morning at the Empire Polo Club. Sunday victories by La Herradura (Meghan Gracida, Carlos Hernandez, Memo Gracida and Catlin Dix) and Evergreen (Tom Sprung, Carlitos Galindo, Juan Jo Gonzalez and Shane Rice) will usher them into next Friday’s semifinals of the 8-goal Champions Cup at the Empire Polo Club with 2-0 records. There was no resting on his laurels for former 10-goaler Memo Gracida as a well-orchestrated La Herradura attack was forced to hold of a determined last chukker rally to register a 13-11 win over REMAX (Dayelle Fargey, Jared Sheldon, Gordon Ross and Matthew Fonseca) in Sunday morning action in the 8-goal Champions Cup at the Empire Polo Club. 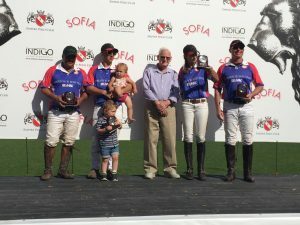 “It was a tough game in more ways than the score,” said the Polo Hall of Famer. Gordon Ross scored the first goal of the game before a pressing La Herradura attack resulted in three consecutive goals. Carlos Hernandez tied the game at 1-1 with his first goal of the day and then put them on top, 2-1, with his second. 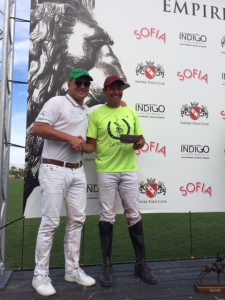 Gracida scored the final goal of the chukker for a 3-1 La Herradura lead. 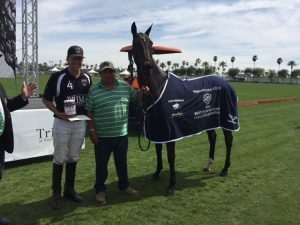 Polo Hall of Famer Memo Gracida added five goals for the Las Herradura win. Gracida’s second goal of the game came in the second period and extended the La Herradura lead to three goals, 4-1. Jared Sheldon got REMAX on track with a goal from the field and a 40-yard penalty conversion that cut the La Herradura lead down to a single goal, 4-3. Hernandez answered back with a pair of goals of his own (one on a 30-yard penalty shot), 6-3. Sheldon countered with his third goal of the period that had REMAX trailing by two goals, 6-4. Two more third chukker goals from Gracida and a goal from Hernandez took control of the game while the La Herradura defense held REMAX to a single goal from Sheldon. At the end of the first half it was La Herradura in front, 9-5. 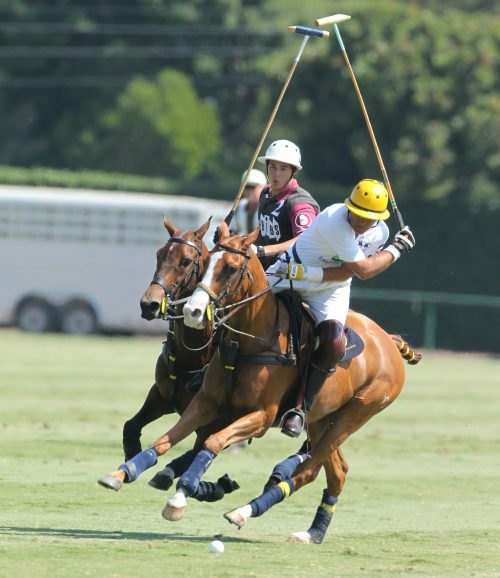 Goals were scarce in the fourth, with Hernandez and Sheldon trading goals for the only scoring in the chukker. After fur periods of play La Herradura continued to hold a four-goal lead, 10-6. A persistent REMAX gained ground in the fifth on the strength of goals from Dayelle Fargey and Matthew Fonseca. Gracida converted a 60-yard penalty shot for La Herradura, whose lead was cut to three goals, 11-8. Sheldon converted a pair of penalty shots for goals and Fargey added another from the field in furious sixth period action. Hernandez was up to the task for La Herradura, however, adding two more goals (one on a 40-yard penalty shot) for the 13-11 victory. Hernandez led the field with eight goals. Gracida added five goals for the win. Sheldon scored a team-high seven goals. Fargey added two goals with Ross and Fonseca each scoring once in the loss. A powerful Evergreen team continued to have their way with their opponents as they opened up on a talented Lockton lineup (Tim Kelly, Bryan Middleton, Hernan Tejera and Francisco Guinazu) in the feature match of the day but came up short in a 12-7 feature game. Lockton got off to an aggressive start, scoring the first three goals of the game on their way to a 3-1 opening. 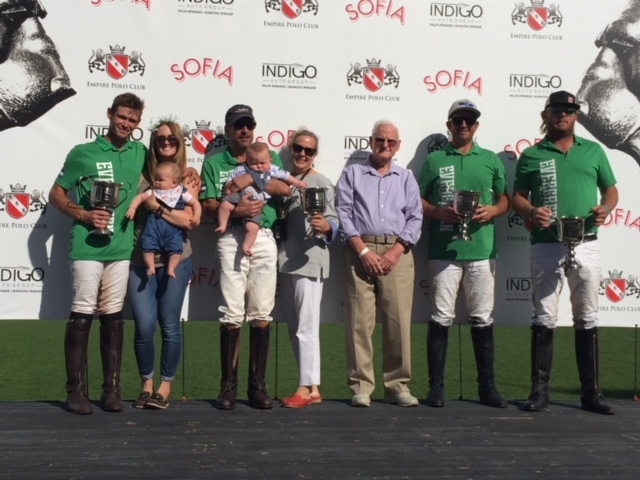 Two goals from Francisco Guinazu and a goal from Bryan Middleton had the Lockton team thinking upset before Carlitos Galindo stopped the bleeding with the final goal of the chukker for Evergreen. Consecutive second period goals from Juan Jo Gonzalez, Galindo and Shane Rice (40-yard penalty goal) had Evergreen on top, 4-3. 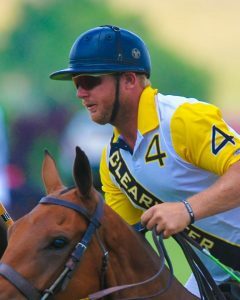 Middleton scored the final goal of the chukker, leveling the score at 4-4. Evergreen’s Shane Rice scored five times in the 12-7 Champion Cup win. Gonzalez and Hernan Tejera traded goals in the third, with Rice adding another penalty conversion to the Evergreen total for a 6-5 lead. Rice split the goalposts for the third tie on the day for the first goal of the second half and a 7-5 Evergreen lead. There was no quit in Lockton as they rallied with goals from Tim Kelly and Guinazu to deadlock the score at 7-7. A combination of horsepower and teamwork won the last two chukkers and the game for Evergreen as they outscored Lockton 2-0 in the fifth on goals from Gonzalez and Rice, 9-7. Three more sixth chukker goals went unanswered as Galindo added two and Rice scored his fifth of the day. A strong defensive effort by Evergreen completely shut down the Lockton attack as they rode on to the 12-7 win. Rice scored three of his five goals from penalty line. Galindo added four goals and Gonzalez was credited with three goals on the day. Guinazu scored three times for Lockton. Middleton added two goals with Tejera and Kelly adding single goals in a losing effort. The 2017-2018 Empire Polo season attracts players from across the country and around the world and offers fourteen weekends of fast-paced polo in the beautiful and relaxed setting of California’s winter playground. The Empire Polo Club is located at 81-800 Avenue 51 in Indio, CA. For further information go to the club website at http://empirepolo.com or call 760-342-7755. Evergreen continues to win at Empire with a 12-9 victory at the expense of a talented REMAX lineup. Evergreen (L to R) Tom Sprung, Juan Jo Gonzalez, Carlitos Galindo and Shane Rice took home the 2018 USPA Constitution Cup. REMAX (Dayelle Fargey, Jared Sheldon, Gordon Ross and Matthew Fonseca) let an early lead get away from them Sunday afternoon in the final of the 8-goal USPA Constitution Cup as a powerful Evergreen lineup (Tom Sprung, Carlitos Galindo, Juan Jo Gonzalez and Shane Rice) outscored them 6-2 in the final three chukkers of play for the win Sunday afternoon at the Empire Polo Club. Evergreen’s Shane Rice scored nine times and earned MVP honors for his efforts. 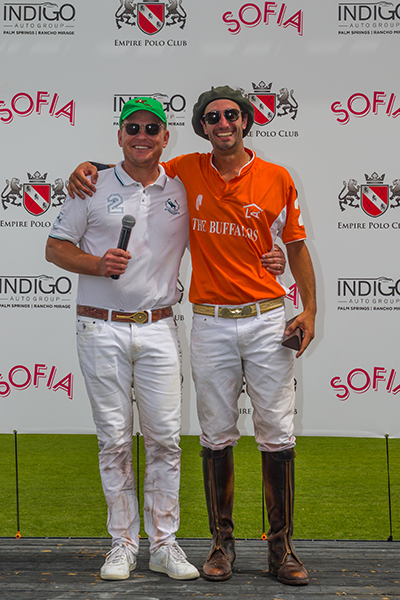 The two teams traded goals in a tentative opening chukker with Evergreen picking up goals from Juan Jo Gonzalez and Shane Rice. REMAX answered back with single goals from Matthew Fonseca and Jared Sheldon for a 2-2 tie. Sheldon added two more goals to the REMAX total n the second while Evergreen was held to a single goal from Carlitos Galindo. After two chukkers REMAX found themselves in the lead, 4-3. The action picked u in the third. Wide open play resulted in a total of six goals. Fonseca scored twice for REMAX with teammate Gordon Ross adding a goal for a total of three goals. However, Evergreen matched them goal-for-goal. An aggressive Evergreen attack resulted in REMAX fouls that sent Rice to the penalty line where he converted twice from the 40-yard mark and once from 60-yards out. At the end of the first half, REMAX continued to defend their 7-6, one-goal advantage. A disciplined and aggressive Evergreen defense held REMAX scoreless in the fourth while the Evergreen offense put two goals on the board. Galindo opened the second half with a goal from the field and Rice added another penalty goal. The lead had changed hands, with Evergreen on top, 8-7. Dayelle Fargey’s pony Peace was named Best Playing Pony. Both defenses were in top form in the fifth, allowing no goals from the field. Fonseca’s fourth goal of the day tied the game at 8-8, but Evergreen battled back. Penalties were costly for REMAX again as Rice took advantage of their miscues, converting penalty shots from 30-yards and 60-yards. The Evergreen led grew to two goals, 10-8, with one period remaining in regulation play. Two more goals from Rice in the sixth (one on a penalty conversion) were countered by a single penalty goal from Ross and Evergreen rode off the field with the 12-9 win. Rice scored a game-high nine goals (seven on penalty shots) and earned MVP honors for his efforts. Galindo added two goals and Gonzalez scored once in the win. Teammate Dayelle Fargey’s pony, Peace, was named Best Playing Pony. Fonseca’s four goals set the pace for the REMAX offense. Sheldon scored one of his three goals from the penalty line and Ross added two goals in the loss. REMAX (Matthew Fonseca, Jared Sheldon, Dayelle Fargey and Gordon Ross), was tournament runner-up. The first round of cousin vs. cousin (Jared Sheldon and Shane Rice) goes to Rice and his Evergreen team, but with 8-goal competition on tap for next weekend, family bragging rights for the season aren’t over yet. 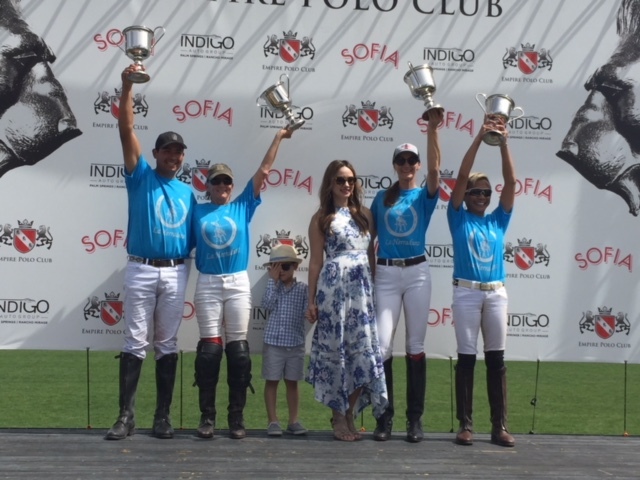 La Herradura (L to R)-Carlos Hernandez, Caroline Anier, Meghan Gracida and Gina Padilla, winners of the 2018 USPA Congressional Cup final at the Empire Polo Club. Photos courtesy of Lynn Bremner. Prima Polo (Robert Payne III, Jenny Alter, Toto Socas and Todd Randall) rode onto the field like gangbusters in the final of the 4-goal 2018 USPA Congressional Cup at the Empire Polo Club Sunday afternoon, but it would be a last chukker rally by La Herradura (Caroline Anier, Gina Padilla, Meghan Gracida and Carlos Hernandez) that would take the day in a hotly-contested 7-5 win. 2018 Congressional Cup MVP, Robert Payne, III. 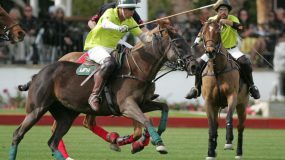 Toto Socas scored the first two goals of the day for Prima Polo followed by a goal from Todd Randall. Shutout defense kept La Herradura off of the scoreboard in the opening chukker as Prima Polo ran up a 3-0 lead. A reorganized La Herradura team put together a coordinated offensive attack in the second period. Caroline Anier scored first followed by a pair of goals from Carlos Hernandez (one on a penalty conversion). This time it was the La Herradura defense that set the tone for the chukker by shutting down the Prima Polo attack. At the end of the first half of the four-chukker match it was all even at 3-3. A determined Prima Polo team got their attack back in gear in the third. Robert Payne, III scored once from the field and once on a 40-yard penalty shot to make it 5-3, Prima Polo. Meghan Gracida got her team on the scoreboard with the final goal of the chukker, but it was Prima Polo with the one-goal lead, 5-4. Robert Payne, III, with his mare Renata, who earned Best Playing Pony honors. La Herradura needed a stellar final chukker to salvage the win, and they got it . Another solid defensive effort was complimented by three consecutive goals from Hernandez (the last on a penalty shot) for the 7-5 victory. Hernandez led all scoring with five goals (two on penalty conversions). Anier and Gracida each scored once for the win. 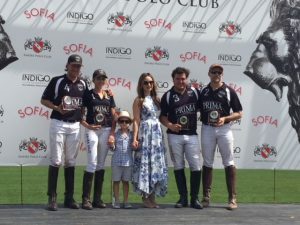 Socas and Payne scored two goals apiece for Prima Polo, with Payne receiving MVP honors for his efforts. Randall added a goal in the loss. Payne’s mare Renata was named Best Playing Pony on the day.